Installed Iconic steel cabinet workspace consisting of 2 lockers, 2 base cabinets and 2 uppers with polished aluminum workspace. Finished in Hammered steel to provide quality and elegant look. Great for golf clubs, sports equipment, tools and liquids to keep out of sight and touch for children’s safety. 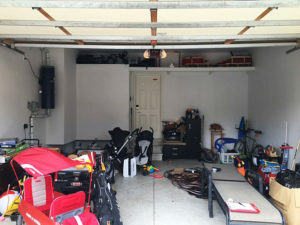 Our garage now has a clean, fresh and professional look, while at the same time satisfying my current needs and allowing the flexibility for future growth as our children grow. The white slatwall and white customized overhead storage is complimented with our by the contrasting darker colour mix of our new polyaspartic floor. Couldn’t be happier! 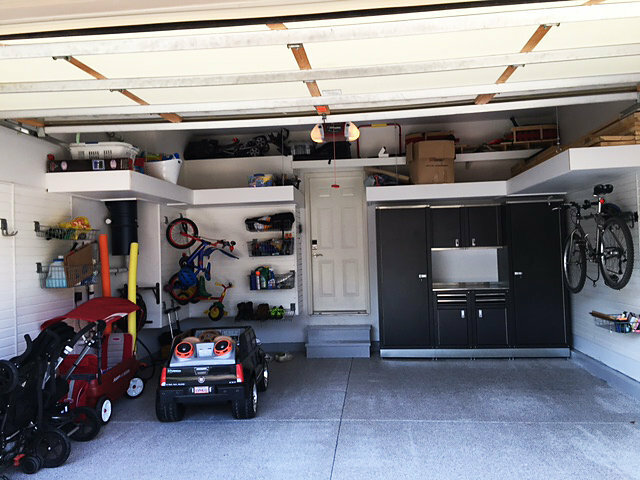 With 2 young children, this young professional couple had a typical new build garage finished with painted drywall. 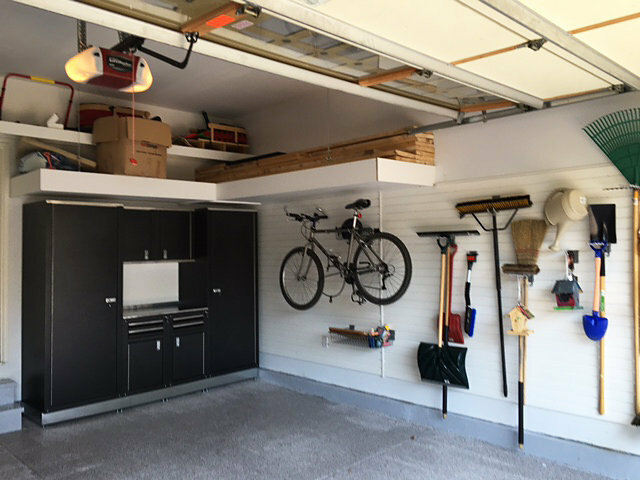 The only challenge after moving into a new build home is that the finished drywall is only the start of a functional garage. 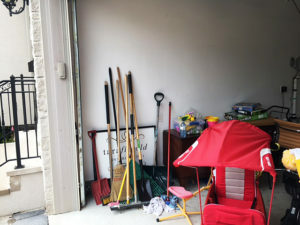 After moving in, they realized that they were amassing winter tools, garden tools and of course, the wide variety of sports equipment and children’s toys used by the kids. They needed a garage renovation so there would be available storage space for today and into the future. 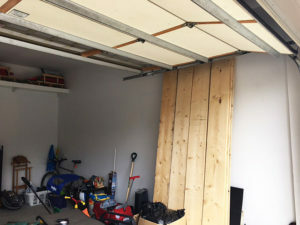 The garage itself is on the taller side so there was a lot of overhead space to leverage but the new home build came standard with only a single small shelf along the rear wall. This shelf was not enough to keep all their belongings off the floor. So, an additional overhead storage system was built along the rear and side walls. It was a custom-built u-shaped platform with a deeper footprint to provide more utility for bulkier and heaver item storage. The airplane cables attached to the ceiling reinforces the platform making them capable of holding 600lbs of their personal belongings. The platform depth makes it possible for them to easily reach the back of the platform to retrieve all items without much effort. With two young kids, it was a good idea to have a combined open and closed storage strategy. An open storage slatwall organization system was designed to store bikes, baskets for sports balls and car accessories as well as hooks so that seasonal tools are easy to find and access. A cabinet system with a workspace offers a closed storage system for a wide range of smaller tools, hardware as well as golf clubs. They are avid golfers who own higher end golf clubs. Storing the clubs away from harm and the elements was important. The whole family are sports enthusiasts. The kids are enthusiastic hockey players. They have bikes and other wheeled toys to roam around the neighbourhood and at the park. 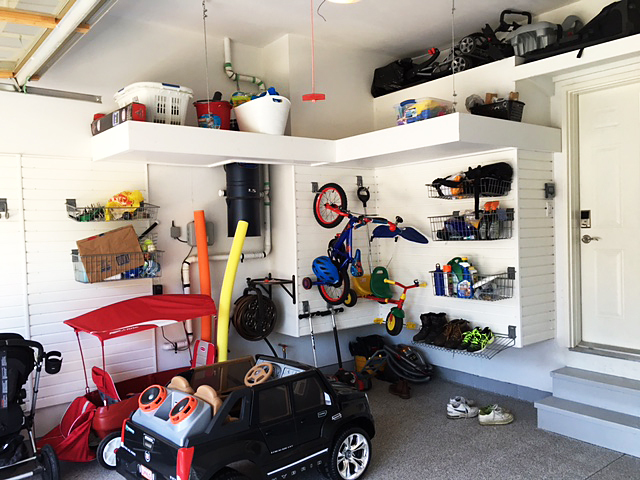 All of their sports equipment and toys needed a storage spot in the garage. 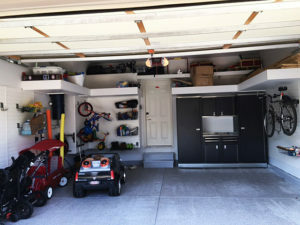 While the foot print of the garage could hold two parked vehicles, the family opted to use one half for storage and only needed one half for parking a single vehicle. 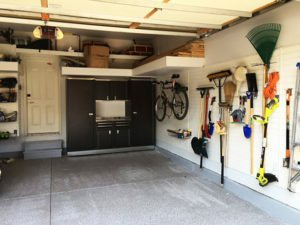 To complete the garage so that it would be easy to maintain and it would feel more like another room in the home, a polyaspartic floor coating was applied over the standard cement floor. This floor coating is durable and much easier to keep clean than cement. Besides protecting the cement floor, it stops cement dust from ending up toys, bikes and sports equipment. 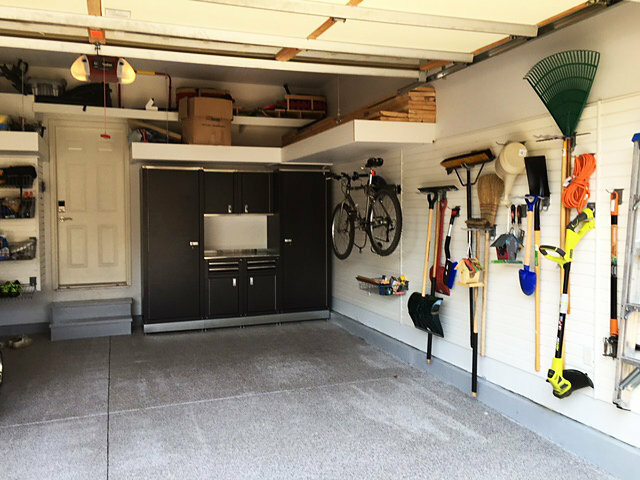 When the garage is a storage space, the polyaspartic flooring helps protect the belongings kept there. For a young family in a new home, planning for growth is one of the key objectives for any garage renovation or home project. The large amount of overhead storage means that the family can grow their interests and past times with space to spare to store the related gear and equipment. With a slatwall storage system, there’s room to re-arrange hooks, baskets and shelves. Slatwall systems are ideal at providing the flexibility to optimize, expand and re-organize the usable storage space and accommodate the family’s changing lifestyle requirements over time.